Kentucky Lake offers all the things you would expect. Miles and miles of uncrowded, almost "Private" waters to boat on....quiet inlets for picnicking, sunbathing, swimming....and hundreds of miles of unspoiled shoreline to leisurely explore...peace and quiet. Good fishing for almost all species of freshwater fish...Bass, Crappie, White Bass, Catfish, Sauger, Bluegill, and Catfish. Our private full service marina offers fishing boats & motors, luxury pontoon boats by Bennington and Sedona, 16.5 ft. fishing boats, single or double wide covered slips with electric for battery charging and, of course, gasoline is available at our marina. Kentucky Lake, acclaimed as one of the finest year 'round fishing lakes in the country, sponsors many national bass tournaments. Fisherman & boaters can take advantage of our "Check in Briefing". 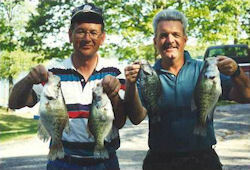 We tell you where & what the fish are biting! We will also provide fishing licenses, professional guides, freezer service, topographical maps, ice, live & artificial bait, tackle, souvenirs, weigh station, launch ramp, & much more.